This hotel is located outside of the centre of Bangkok. The airport can be reached within 10 minutes. Guests are offered a lobby with a 24-hour reception, a safe and a cloakroom. Further facilities include some shops, a café and a bar. A Chinese and a Japanese boutique restaurant invites guests to stop off and indulging bite. Room, medical and laundry services complete the offer. The air-conditioned rooms come with an en suite bathroom and well-furnished living area with a kitchenette and a double bed. The guests are welcomed to relax in the swimming pool, on the loungers or in the Jacuzzi. 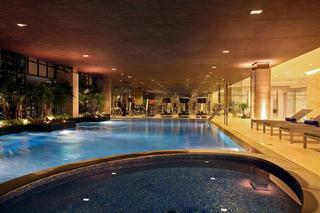 Sports enthusiasts may pay a visit to the in-house gym or play golf. Guests are offered meals in the form of a buffet. Lunch and dinner may be taken à la carte or chosen from the menu.Free shuttle service from hotel to Don Mueang International Airport (upon time schedule):06.30 hrs.08.30 hrs.11.00 hrs. Novotel Bangkok IMPACT is an international 4-star convention hotel ideally located at the heart of Thailand's largest meeting and events venue, IMPACT Exhibition and Convention Centre and IMPACT Arena. Whether you are planning a wedding, attending a concert or conference, this modern hotel is the best accommodation solution for delegates and leisure guests alike. With 380 rooms, 2 restaurants, spa, gym and swimming pool as well as an elegant lobby bar, the hotel can accommodate your every needs. 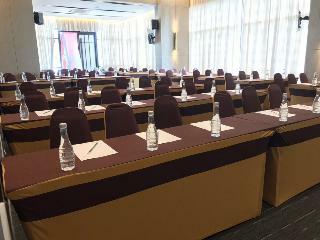 Located at just 15 minutes on foot from IMPACT Exhibition and Convention Centre, the largest centre of its kind in Thailand, this hotel is a great choice for conference tourism. Laksi railway station is approximately 1.6 km away and its guests will be just a 10-minute drive from the Don Muang Airport. Business travellers will be quite well taken care of with the modern conference and banqueting facilities that the hotel can offer them. The professionally trained staff can help with all the organizational details so the event can turn into a success. In the meantime, they can relax around the outdoor swimming pool and enjoy the lovely weather. All rooms provide conveniences like refrigerators and electric kettles. Those who want to check the cuisine that the venue serves can visit the restaurant and try its excellent Thai and International delights. There is even an option for late night in room supper for guests' convenience. Business travellers will take pleasure in their stay at the hotel, which provides an atmosphere that is both productive and comfortable. This comfortable Hotel can be found in Don Muang. The property features a total of 200 units. The Riche Boutique Hotel is right at the heart of the Bangkok's Business districts. The Riche Boutique Hotel is only 20 minutes to Mo chit BTS Sky Train Station and Jatujak weekend market. 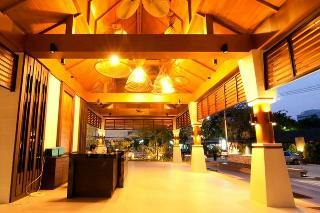 It's ideal for travelers who prefer a cosmopolitan location yet business-like, quiet and happening. It's only 15 minutes to Don Mueang International Airport. The Riche Boutique Hotel is at the heart of all. "Sleep Box by Miracle is a stylish and chic hostel with contemporary design which has been designed to surprise and please guests in transit or awaiting flights in Bangkok. Sleep Box by Miracle is located on the fourth floor of the domestic passenger terminal (Terminal 2) at Don Muang International Airport, with extremely convenient access for passengers.Our modern airport hostel in Bangkok provides 55 rooms, all with an en-suite bathroom and decorated in chic and contemporary style using black and white colors, offering a comfortable double bed, air-conditioning, flat-screen TV, amenities, free Wi-Fi etc. Rooms are available by the hour and by night. Shower facilities are also available." Situated 9 km from Rangsit University, Bangkok Boutique Resort offers 4-star accommodation in Pathum Thani and has free bikes. With an outdoor swimming pool, the property also features a terrace, as well as a shared lounge. The hotel offers an Asian restaurant.All guest rooms at the hotel come with a seating area, a flat-screen TV with satellite channels and a private bathroom with free toiletries and a shower. Bangkok Boutique Resort features certain rooms with pool views, and the rooms have a shared bathroom. 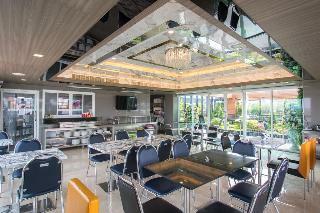 The rooms at the accommodation include air conditioning and a wardrobe.Guests at Bangkok Boutique Resort will be able to enjoy activities in and around Pathum Thani, like cycling.The reception can provide advice on the area in order to help guests plan their day.The nearest airport is Don Mueang International Airport, 12 km from the property. Located just a 10-minute drive from Don Mueang International Airport, B-yourhome offers fitness center, an outdoor pool and a garden. Free WiFi is available in all rooms. 24-hour room service is provided for guests' convenience.Featuring a desk, a TV, and a safe box, every room in the hotel is fully furnished. B-yourhome provides some rooms with city views, and rooms are fitted with a terrace. All rooms at the accommodations include air conditioning and a wardrobe.A buffet breakfast is available every morning at the property. This property also comes with a restaurant.Chatuchak Weekend Market is 9.3 mi from the hotel, while Siam Discovery is 12 mi away. The nearest airport is Don Mueang International Airport, 0.6 mi from B-yourhome. Central Festival EastVille is 8.7 mi away. Donmuang is a great choice for travelers interested in photography, hot weather and traditional food. Great pool and nice room.